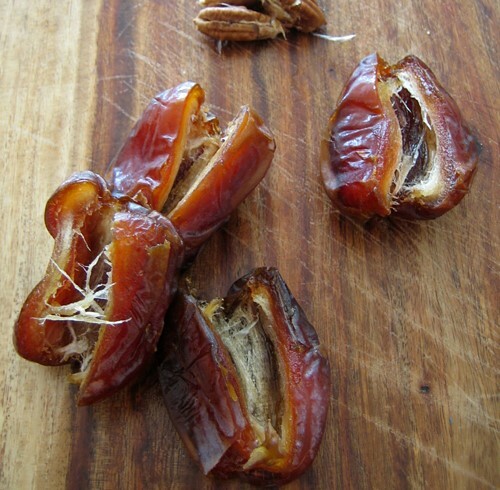 I’ve previously written about the health benefit of dates, and it’s dates I want to talk about again. Dates are simply a kitchen staple. This time, though, let’s focus on using them to sweeten foods typically calling for sugar. Their sticky-sweet texture makes them great for binding nuts into bars and crusts for tarts. They’re a subtle sweetener for energy drinks and smoothies. And they’re a perfect sugar substitute when baking. 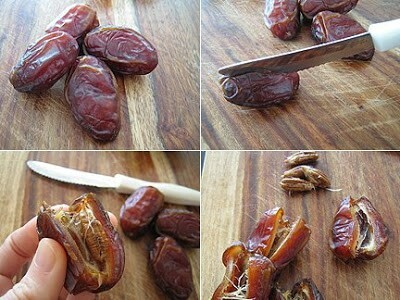 OK, now how to sweeten foods using dates. Yum Universe (yumuniverse.com), a whole foods site written by Heather Crosby, uses date paste for this and explains that this healthy high-fiber sweetener allows the sugars to release into the bloodstream the way nature intended—slowly and in natural amounts, allowing you to become full faster. So her method is to always keep a jar of date paste (also called puree) in her refrigerator. She uses it daily. For instance, Heather suggests mixing a spoonful of date puree into a glass of pure water with a squeeze of lemon for a natural, simple energy boost before a walk or workout. 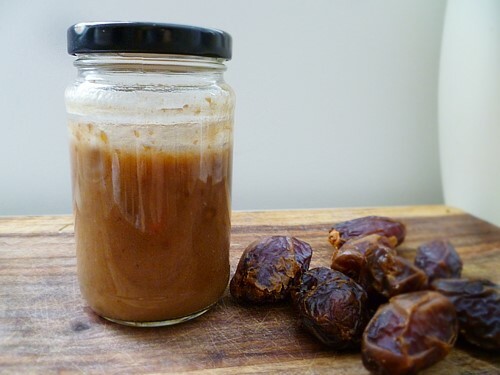 It takes around 10 minutes to make approximately 1 cup of puree using 10 pitted medjool dates and ½ cup of water. Tool-wise, all you’ll need is a high-powered blender or food processor, and a glass jar with lid. Store in an airtight glass container in the fridge; the puree will keep for 7 to 10 days. Place the pitted dates and water in your blender and process until thoroughly mixed. 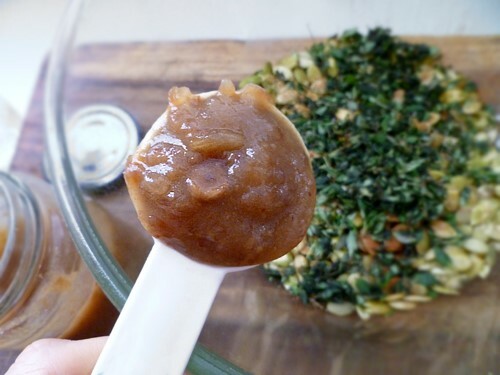 By the way, Heather says that if you’re not crazy about dates, you can also make a very fine natural and healthy sweetener using pears, apples, or dried apricots or raisins. Using a small serrated or pairing knife, slice 1/4″-1/8″ down lengthwise into the date. You should hit the pit. Pull open the date and remove pit. And that’s it. I’ve found it’s best to pit an entire package at once since I have the tools out, the wherewithal and the momentum going. I’m storing them in the fridge and then when I need more date paste, yippee, the pitting chore is already taken care of. I’ll close with a delicious snack that’s good to have on hand at the office, in your purse or car, so when you get hungry, you have a healthy option ready. This can also be added to a salad for crunch and unique flavor. 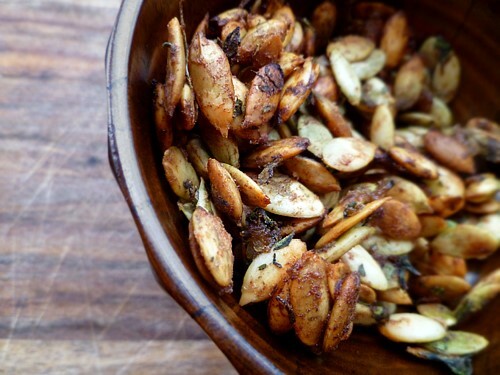 You can prepare it either raw in a dehydrator for optimal nutrition, or toasted in the oven. This is Heather’s recipe, and it’s delicious! Soak your seeds for 6-8 hours to remove the enzyme inhibitors/phytic acids. Overnight works well for this. You can always skip this step, but it’s not recommended. By soaking, enzyme inhibitors are neutralized, the beneficial enzymes are activated, and the vitamin content increases. Soaking makes seeds, nuts, and legumes easier to digest and the nutrients more easily absorbed. Think about it like this, snakes have fangs, porcupines have quills, and plants have anti-nutrients to protect themselves. You can prepare this recipe two ways: dehydrated and raw, or toasted. If toasting, preheat oven to 350°F. Dry your seeds with a paper towel or cloth. For both methods, place all ingredients in a large bowl and mix well. If dehydrating your seeds: Place mixture onto a dehydrator screen and spread out so mix is a maximum of 2 seeds deep. Place tray in dehydrator set to 95-100°F and allow to dry for 6-8 hours. You can always dry longer to reach the texture/dryness that you like. If toasting your seeds: Spread mixture onto a parchment-lined cookie sheet and spread out so mix is a maximum of 2 seeds deep. Toast in the oven for about 10-15 minutes, until browned. Keep an eye on your seeds, you don’t want to burn them. Remove and allow to cool. Store in an airtight glass container in the pantry or fridge.